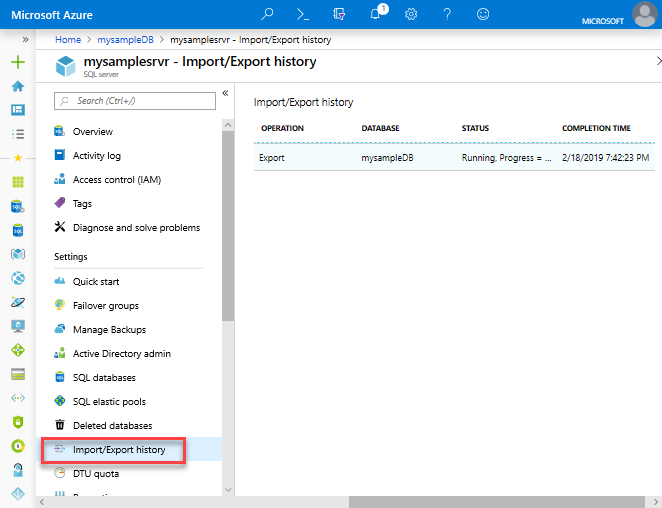 For an export to be transactionally consistent, you must ensure either that no write activity is occurring during the export, or that you are exporting from a transactionally consistent copy of your Azure SQL database. If you are exporting to blob storage, the maximum size of a BACPAC file is 200 GB. To archive a larger BACPAC file, export to local storage. Exporting a BACPAC file to Azure premium storage using the methods discussed in this article is not supported. Storage behind a firewall is currently not supported. Temporarily increase your compute size. Cease all read and write activity during the export. Use a clustered index with non-null values on all large tables. Without clustered indexes, an export may fail if it takes longer than 6-12 hours. This is because the export service needs to complete a table scan to try to export entire table. A good way to determine if your tables are optimized for export is to run DBCC SHOW_STATISTICS and make sure that the RANGE_HI_KEY is not null and its value has good distribution. For details, see DBCC SHOW_STATISTICS. BACPACs are not intended to be used for backup and restore operations. Azure SQL Database automatically creates backups for every user database. For details, see business continuity overview and SQL Database backups. A managed instance does not currently support exporting a database to a BACPAC file using the Azure portal. To export a managed instance into a BACPAC file, use SQL Server Management Studio or SQLPackage. To export a database using the Azure portal, open the page for your database and click Export on the toolbar. 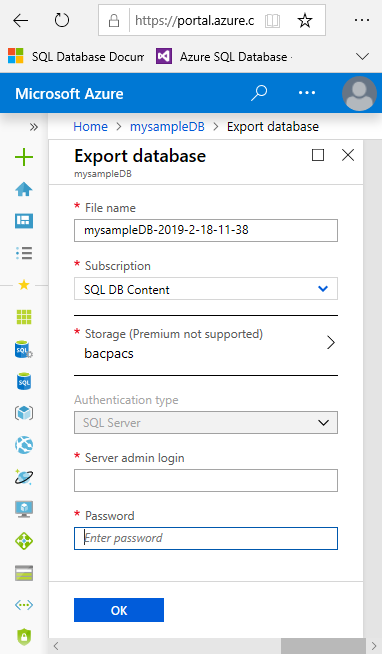 Specify the BACPAC filename, select an existing Azure storage account and container for the export, and then provide the appropriate credentials for access to the source database. To monitor the progress of the export operation, open the page for the SQL Database server containing the database being exported. Under to Settings and then click Import/Export history. To export a SQL database using the SqlPackage command-line utility, see Export parameters and properties. The SQLPackage utility ships with the latest versions of SQL Server Management Studio and SQL Server Data Tools for Visual Studio, or you can download the latest version of SqlPackage directly from the Microsoft download center. We recommend the use of the SQLPackage utility for scale and performance in most production environments. For a SQL Server Customer Advisory Team blog about migrating using BACPAC files, see Migrating from SQL Server to Azure SQL Database using BACPAC Files. The newest versions of SQL Server Management Studio provides a wizard to export an Azure SQL database to a BACPAC file. See the Export a Data-tier Application. A managed instance does not currently support exporting a database to a BACPAC file using Azure PowerShell. To export a managed instance into a BACPAC file, use SQL Server Management Studio or SQLPackage. Use the New-AzSqlDatabaseExport cmdlet to submit an export database request to the Azure SQL Database service. Depending on the size of your database, the export operation may take some time to complete. To check the status of the export request, use the Get-AzSqlDatabaseImportExportStatus cmdlet. Running this immediately after the request usually returns Status: InProgress. When you see Status: Succeeded the export is complete. To learn about long-term backup retention of a single databases and pooled databases as an alternative to exported a database for archive purposes, see Long-term backup retention. You can use SQL Agent jobs to schedule copy-only database backups as an alternative to long-term backup retention. To learn about importing a BACPAC to a SQL Server database, see Import a BACPAC to a SQL Server database. To learn about using the Data Migration Service to migrate a database, see Migrate SQL Server to Azure SQL Database offline using DMS. If you are exporting from SQL Server as a prelude to migration to Azure SQL Database, see Migrate a SQL Server database to Azure SQL Database.